So much so far for the prohibitive favorites in Vancouver and Pittsburgh. So much for the Pacific Division being a bunch of slouches. So far so good for the Los Angeles Kings, as they take a commanding 2-0 series lead. Late in the first, the Kings took advantage of a lackluster Canucks power-play (still without Daniel Sedin), which is 0-for-10 thus far in the series. An aggressive takeaway by Anze Kopitar, helped setup a hard charging Dustin Brown. With nine seconds to go, Brown buried the shorty past Roberto Luongo and put the Kings ahead by one. Vancouver would respond quickly in the second, Jannik Hansen beat Jonathan Quick and knotted the contest at one. 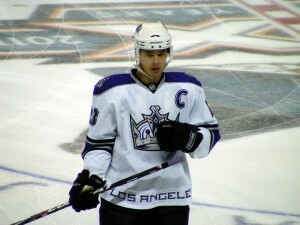 However, the Kings took advantage of another Canucks turnover and cashed in. Again it was Brown, streaking down the boards and beating Luongo with yet another short-handed tally. Brown became the first player since John Madden in 2005-06, to net two short-handed goals in a playoff game. In the third, L.A. would pad its lead. This time with the extra attacker. Jarret Stoll would stuff home his first of the post-season and the Kings went up 3-1. Speaking of stuff, a wraparound stuff by Trevor Lewis, increased the Kings’ advantage to 4-1. While Sammy Pahlsson would get a marker late for Vancouver, this one was all but over. There were some positive signs in this one for the Canucks, that didn’t translate to the scoreboard. For instance, they did some out with a fury of shots and scoring opportunities in the first. One can call it frustrating, but they did out-hit the Kings (45-32) and out-shot them (48-26). Ultimately though the difference maker was the Kings capitalizing on their opportunities and of course their biggest penalty killer Quick, making 46 stops on the evening. Hence, the Kings find themselves heading home up 2-0.